“As breastfeeding supporters, we need to understand that the small percentage of women who cannot produce enough milk is real. 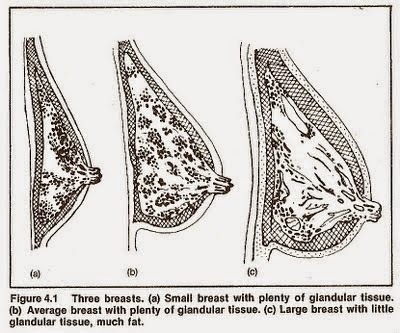 One of the least understood causes of low – or sometimes no – milk production is breast hypoplasia, also known as insufficient glandular tissue (IGT). What is IGT? If we liken the lactating breast to a factory, then we could say that, for women with IGT, the workers went on strike before the factory was completely built. This makes it difficult for the factory to bring production up to 100%. She might produce 80% of the milk her baby needs or just 10%. For some, production won’t ever get off the ground. 5. Mempunyai payudara yang hypoplastic: kecil / besar, mempunyai jarak yang luas antara payudara kiri dan kanan, saiz payudara yang tidak sama / assymmetrical (sebelah besar dan sebelah kecil), dan payudara berbentuk tubular (memanjang ke bawah). Namun begitu tidak semua ibu yang mempunyai bentuk payudara seperti ini mengalami masalah IGT.